The Manual describes each feature as it appears in the app. In the menu you'll find the different tabs that correspond with the tabs in your app and it's features. 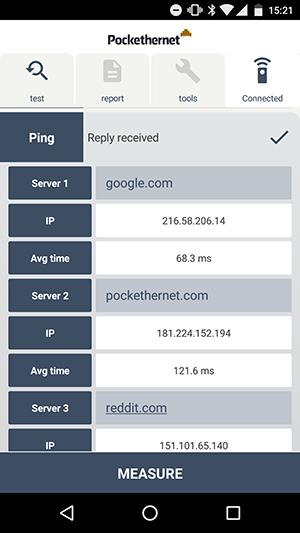 If you just want to get started quickly, head over to getting started to quickly learn the basics of pairing your Pockethernet and start testing. To prevent fire or shock hazard, avoid exposing this unit to rain or moisture. Do not attempt to service this unit yourself. Please refer all servicing to your distributor / retailer. Do not open or disassemble the device. There are no user serviceable parts. Do not use strong or abrasive detergents when cleaning the device. Risk of fire, explosion, and burns. Do not disassemble or crush. Use a certified power adapter only. Voltage and current requirement for charging and operation is 5V at 1A. The device must only be connected to a Network Environment 0 per IEC TR62101. Do not connect to cables that are routed outside of a building. This device complies with part 15 of the FCC Rules. Operation is subject to the following two conditions: (1) This device may not cause harmful interference, and (2) this device must accept any interference received, including interference that may cause undesired operation. This Class B digital apparatus complies with Canadian ICES-003. This equipment has been tested and found to comply with the limits for a Class B digital device, pursuant to Part 15 of the FCC rules. These limits are designed to provide reasonable protection against harmful interference in a residential installation. This equipment generates, uses and can radiate radio frequency energy and, if not installed and used in accordance with the instructions, may cause harmful interference to radio communications. However, there is no guarantee that interference will not occur in a particular installation. If this equipment does cause harmful interference to radio or television reception, which can be determined by turning the equipment off and on, the user is encouraged to try to correct the interference by one or more of the following measures: Reorient or relocate the receiving antenna. Increase the separation between the equipment and the receiver. Connect the equipment into an outlet on a circuit different from that to which the receiver is connected. Consult the dealer or an experienced radio/TV technician for help. When this product has reached the end of its useful life, please dispose of it according to your local environmental laws and guidelines and take it to a collection point designated by local authorities. Some collection points accept products for free. The separate collection and recycling of your product at the time of disposal will help conserve natural resources and ensure that it is recycled in a manner that protects human health and the environment. This manual has been compiled and published covering the latest product descriptions and specifications. The contents of this manual and the specifications of this product are subject to change without notice. We reserve the right to make changes without notice in the specifications and materials contained herein and shall not be responsible for any damages (including consequential) caused by reliance on the materials presented, including but not limited to typographical and other errors relating to the publication. Requires Bluetooth 2.1 classic compatible with Android 4.3 or higher. 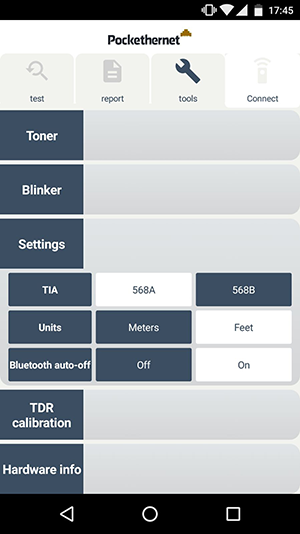 The Pockethernet app needs BLE (bluetooth 4.0) to communicate with your device. Bluetooth 4.0 (BT LE), also known as Bluetooth Low Energy and Bluetooth Smart is omnipresent in almost all smartphones and tablets since 2011. 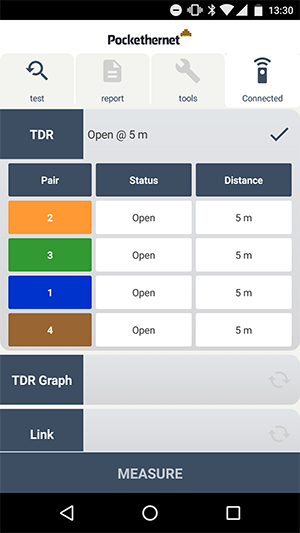 The app consist of three main sections: Test, Report and Tools. Once the test is successfully performed, the icon will turn into a checkmark. All checkmarked results will be included in the report. To do a quick measurement without the smartphone application connected, press the On/Off button briefly. Results are shown on the wire pair status LEDs. Use this button to switch the device on and off or reset it in case of software failures. While the USB port is connected, no measurements can be made. Should the device show symptoms of software failure; not going through the measurement cycle, not charging or communicating with the smartphone application. Press and hold the power button (1) for 10 seconds and then connect the USB cable to reset the device. Do not connect Pockethernet to the USB port yet! Driver installation for Windows 7 and 8 only: Open the folder in a Windows file explorer, right click "Pockethernet Driver Beta.inf", select "Install". Confirm installation. (No actual driver binary needs to be installed, the inf file only instructs Windows to use its built-in USB CDC serial driver with Pockethernet) Windows 10 already has the necessary driver built-in. 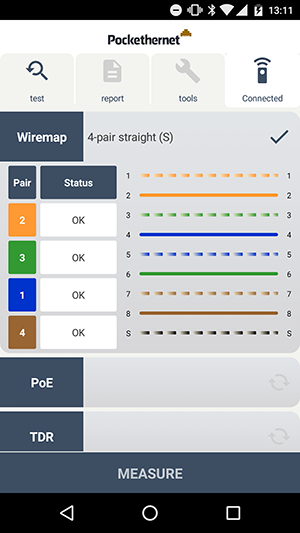 Run the updater with "./pockethernet-vXY-beta-fwupgrade /dev/ttyACMx"
The wiremap test determines (by transmitting signals through each wire) if a pin on a connector is connected to the correct pin at the other end. The graphical wiring diagram shows the status of each individual wire: the corresponding connected pin is shown on the right side. In case of short circuits between the wires, these are shown with a red vertical connection, opens are shown in the middle as a break in the line. 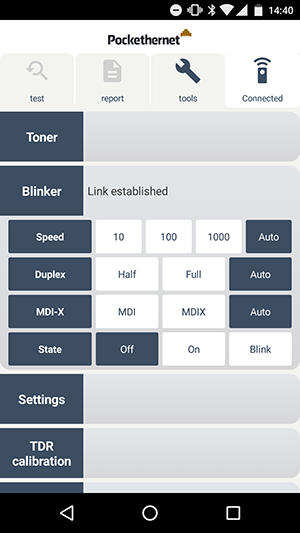 The pair numberings and colors are based on the TIA colour scheme selected in the tools -> settings menu. To get a valid result, you need the have the Pockethernet terminator adapter with the "Wiremap" side attached to the other end of the cable. Pockethernet is only compatible with the wiremap adapter that came with Pockethernet. 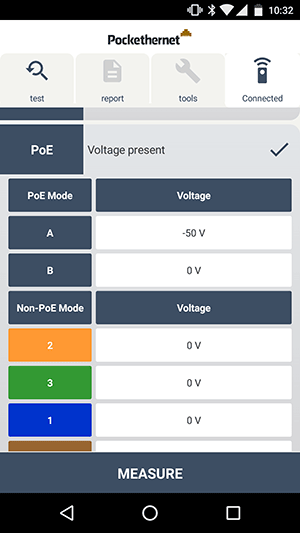 This test verifies the presence of a Power over Ethernet supply in mode A (pairs 2+3/Endspan) or mode B (1+4/Midspan) and reports the voltage measured. Additionally, voltages are also measured on each wire pair separately (e.g. pins 1+2, 3+6,...) to detect the presence of analog phone lines. The PoE results - if present - are shown in the main summary line of the measurement, the individual pairs in a table below. The TDR-based, single ended length measurement and fault locating tests the physical properties of a cable, with just one end connected to Pockethernet. See how long the cable is and if there are any short circuits, split pairs or bad terminations. Pockethernet also detects if the cable is connected to a switched off computer or switch. The length cannot be determined if the cable is connected to another Ethernet port, as a properly terminated connection doesn't provide signal reflections that can be measured. Also, switched on Ethernet ports on the other end can provide false results as the other device is actively transmitting signals that interfere with the measurement. This features allows you to measure the imperfections of a cable along its whole length or a section of it. A short electrical pulse is sent down the cable, which is reflected from imperfections (short circuits, split pairs, impedance mismatches, open ends) or absorbed by proper termination (another ethernet port). The cable is measured from its beginning until the distance that is set by the slider. 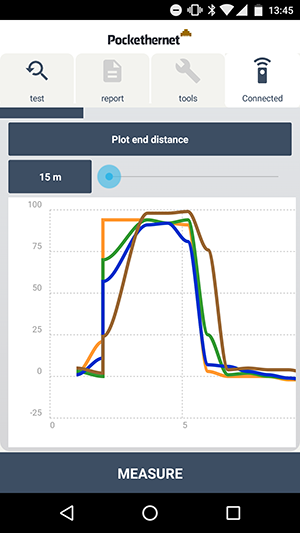 For a distance up to 30 meters / 100 feet, a high-resolution plot is conducted. The maximum distance is 300 meters / 1000 feet. On the plot graphics, the horizontal axis shows the distance, while the vertical axis shows any reflections of the initial test pulse. The 4 color lines correspond to the 4 wire pairs in the cable according to the TIA settings. Short circuits show up as a negative reflection, open ends as a positive one, while with a proper termination the graph is completely flat. Small imperfections in the +/- 10 range can be caused by cable extenders or patch panels, which can be conveniently detected by this feature. This test determines if an ethernet link can be established, what the highest achievable speed is. The result is shown in the summary line: 10 / 100 / 1000 Mbit, Full Duplex / Half Duplex, MDI / MDI-X. 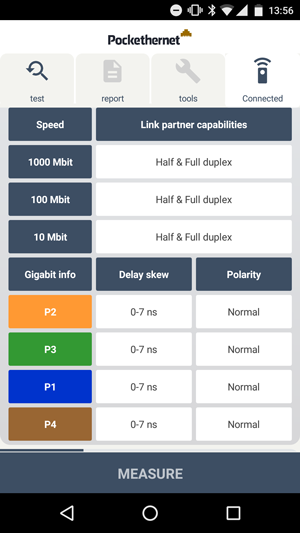 On gigabit links, additional information is shown: The delay skew of each pair (maximum allowed per IEEE specification is 45ns) and the polarity of each wire pair, which helps detecting any wiring errors. 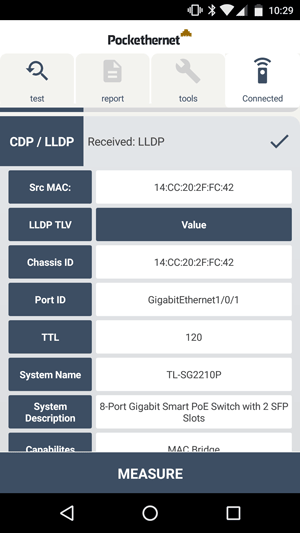 When activated, Pockethernet waits for up to 65 seconds after link establishment to receive CDP or LLDP packages. 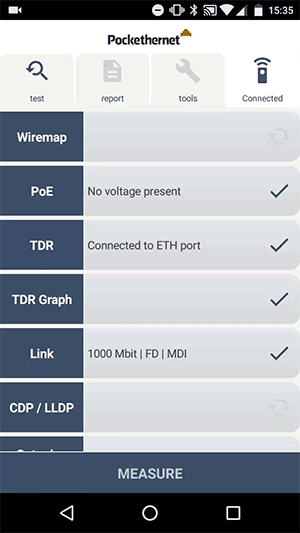 These diagnostic packages contain information about the connected switch or router, like the physical port ID Pockethernet is connected to, the system name or management IP address. Information fields, called TLVs of the received packet are listed in the details section of this measurement. A link test will always be selected in order to test the CDP/LLDP settings. The app will auto-select it once you select the CDP/LLDP test. By activating this option, you can set up Pockethernet to use 802.1q VLAN tagging for any outgoing packet of DHCP requests or pings. 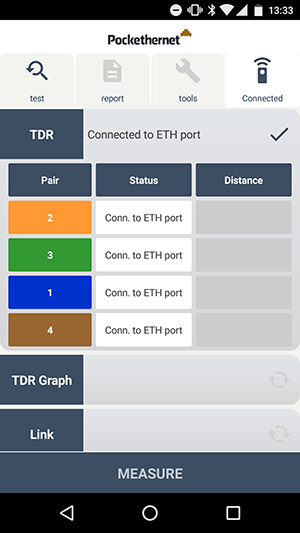 This allows you to test the network connectivity on a specific VLAN (ID), while also defining the packets priority (PCP: 0-7) and the Drop eligible indicator (DEI). 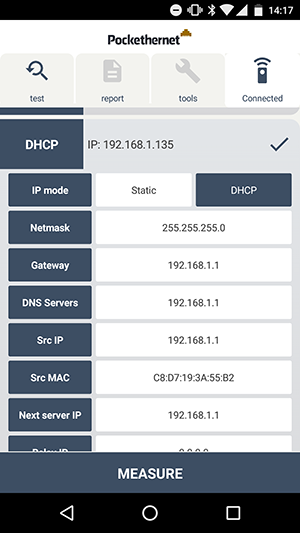 This section allows you to test the networks DHCP settings and make Pockethernet request its IP configuration via DHCP, or you can set up static IP settings to be used for the ping tests. 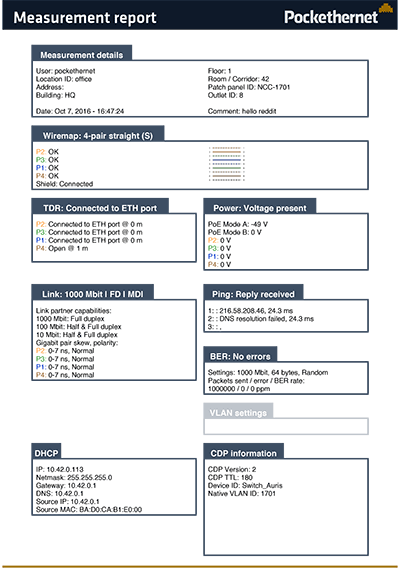 In case of DHCP, the DHCP offer from the server is parsed and all important fields (e.g. server IP and MAC address, lease times, further servers) are listed in the details. A link test will always be selected in order to test the DHCP/static IP settings. The app will auto-select it once you select the CDP/LLDP test. You can enter up to three IP addresses or domain names to be pinged. The results include the pinged IP address (so that this test can also be used for DNS resolution) and the average ping time of 3 measurements. A link test and DHCP test will always be selected in order to perform a ping test settings. The app will auto-select it once you select the CDP/LLDP test. The traffic sampling feature allows you to see samples (i.e. not all packets are forwarded to the APP) of the network traffic. 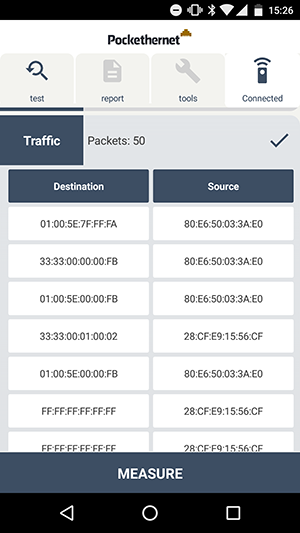 Pockethernet will wait for 60 seconds and forward some of the the incoming packets to the app, where the destination and source MAC address are displayed along with any VLAN tag and the ethernet protocol/frame size field. A link test will always be selected in order to perform a traffic test. The app will auto-select it once you select the CDP/LLDP test. The Bit Error Rate Test measures the overall quality of a cable run by sending and receiving large amount of ethernet frames and measuring how many of them get corrupted along the way. 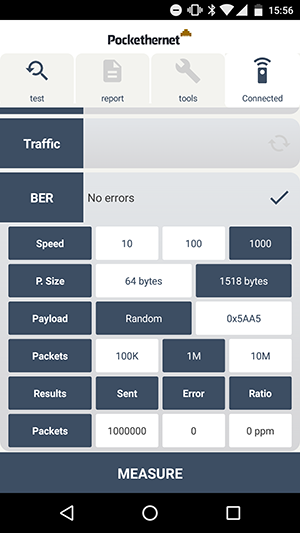 To test different scenarios, you can configure the link speed which is used, the packets length and contents (fixed pattern of 0x5AA5 bytes or a pseudo-random sequence). The ratio of packets with CRC errors will be displayed in percent or ppm (parts per million) and is a directly proportional to the cabling quality. The toner function allows identification and tracking of cables via an electronic signal that can be picked up with a tone probe. 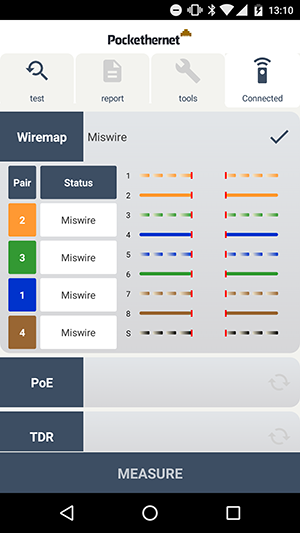 You can use it to identify individual cables in a bundle, identify individual wire pairs and track their path in culverts and walls. You can select on which wire pair the signal should be transmitted, which tone should be used at what volume. You can use any analogue tone probe to pick up the signal. As the signal can radiate into nearby cables, use the minimum volume that is still trackable to more easily distinguish cables. You can use this function to identify the ethernet port on switches and routers to which the cable is connected, by making the link LEDs blink. As a secondary function, you can manually test if a link can be established at specific speeds and duplex settings. This allows you to calibrate the TDR distance measurement and to adjust for the NVP of the currently inspected cable. As the 4 wire pairs in a cable have different twist rates and therefore different length, they can be adjusted separately. For the calibration process, you need to connect a cable with all 4 pairs disconnected and of at least 5 meters length. Then press the Measure button, wait for the results and adjust the sliders of each pair, so that the 'Calibrated' values match the actual length of the connected cable. You'll find the details on your hardware version, firmware and MAC address of your Pockethernet in here. The report tab is the place to export your test results. You can download all your data to a PDF or share them through other applications on your phone with the press of a button. In the report tab you can add comments and more details of the test environment that will make it easier for you to identify the results afterwards. Do your desired testing. All tests which contain a checkmark at the point of creation will be included in the report.